Habitat: Low forest; all but WY. Anomalously, it grows in the open on Silver Star Mountain at almost 4,000 feet above sea level. 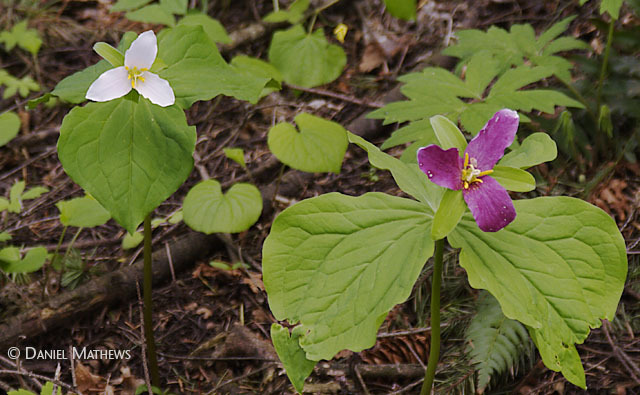 Similar: Purple Trillium, Trillium petiolatum, a stemless version with a maroon to purplish or greenish flower emerging from a whorl of stalked leaves ± at ground level, is common in n ID, ne OR, and ne WA. Natural History: Trilliums and quite a few other white flowers shift color as they age. This is interpreted as an example of an adaptation from which the members of a group benefit, even though each individual only benefits from the other members of the group doing it. The magenta trillium flowers help attract insect pollinators to the patch of trilliums, but once the insects are there they are attracted mainly to the white flowers. It’s as if the magenta flower were telling pollinators, “Don’t waste your time on me, I’m old, probably pollinated already, and don’t have much pollen left for you.” This saves the pollinators energy, increasing the overall efficiency of pollination and thus benefitting the trilliums. Later, when it’s time to attract disseminators, the trillium switches to a gastronomic lure, packing its seeds in a gummy oil that ants find tasty. 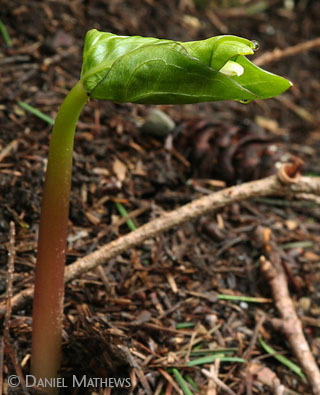 Trillium is one of the earliest herbs to rise in spring. The flower unfolds almost simultaneously with the leaves and beautifully wrapped up in them (photo 3), protecting the tender flower bud from late frosts. Quinault elders used to warn youngsters that picking a trillium would bring rain—a safe bet in Quinault country in spring. Whites spun the less bankable yarn that picking the flower will kill the plant. It merely discourages it. Still, waiting to pick the seeds is a better choice: with luck and a little effort you can have have trilliums blooming year after year in a shady spot. Trillium seeds require two winter chillings before producing a shoot. You can use your refrigerator for one of them. A study of the failure of trillium to reproduce within 200′ [65 m] of clearcuts in the Siskiyous concluded that trillium probably can’t handle the additional wind and drying effects there, in an area that is already barely moist enough for it. It does much better in cooler, rainier climates—suggesting that trillium numbers may decrease with increased forest management and global warming.